View the full size version of the chart..
Delivering risk-appropriate prophylaxis to hospitalized patients can prevent up to 70 percent of venous thromboembolism (VTE) cases, according to published studies. Yet a large body of research indicates that patients do not reliably receive these treatments, in the form of anti-clotting medications, such as heparin, and mechanical devices that reduce blood clot formation. One multinational study, for example, found that 58.5 percent of surgical patients and 39.5 percent of medical patients received appropriate VTE prophylaxis. Nearly a decade ago, The Johns Hopkins Hospital’s performance on VTE prevention measures mirrored that of other hospitals. In 2005, a chart audit of several high risk patient populations found that just 32 percent received risk-appropriate VTE prophylaxis. However, over time the hospital has gradually increased that performance to greater than 90 percent, and it continues striving for 100 percent. Below are several of the key strategies that have helped us achieve this improvement. For every patient, providers must balance the risks of bleeding and clotting. They must consider risk factors, such as bone fractures and major surgery, and contraindications, such as gastrointestinal bleeding, and their treatment recommendations should be informed by the medical evidence. Giving the same VTE prophylaxis to all patients without regard for their individual factors may actually cause more harm than benefit. As an initial intervention, the hospital’s VTE Collaborative developed order sets that were tailored to 16 different patient types, such as trauma, surgery and medicine. For each order set, algorithms help physicians to assign patients to different risk categories. Based on each patient’s risk level, providers receive guidance on which prophylaxis orders are most appropriate. Initially, these order sets were available only in paper form. After they were introduced, performance on risk-appropriate VTE prophylaxis reached 65 percent—roughly doubling the previous rate. However, performance still fell short of the hospital’s goal. There were no “hard stops” to ensure that patients’ risk of blood clots was considered by physicians, who often felt that completing the forms was burdensome. To ingrain VTE prophylaxis assessments into clinicians’ workflow, the hospital built service-specific order sets into the computerized provider order-entry system. A mandatory screen guides clinicians to select risk factors and contraindications, while the system also pulls in data from the electronic record to make the risk assessment and issue recommended orders. This risk assessment is required, but physicians can still choose to deviate from the recommendation based on other clinical considerations. With the addition of computerized clinical decision support, the hospital’s performance on ordering appropriate prophylaxis increased substantially, with rates generally between 80 percent and 90 percent. These improvement efforts were detailed in a June 2012 BMJ article, and recently an update in the Journal of Hospital Medicine. The VTE Collaborative worked with information technology experts to create a series of measures, such as the percentage of patients risk-stratified for VTE within 24 hours of admission and ordered risk-appropriate prophylaxis. Monthly reports were distributed to departmental leaders and quality improvement staff. The team also built an online database to assess performance at the level of institution, department, division, service and individual provider. While computer-guided decision support improved risk-appropriate prophylaxis ordering to greater than 80 percent, additional measures are needed to approach 100 percent compliance. One step that has shown promise is the distribution of provider-level dashboards, allowing physicians to see their VTE prophylaxis ordering rates and compare them to other benchmarks. 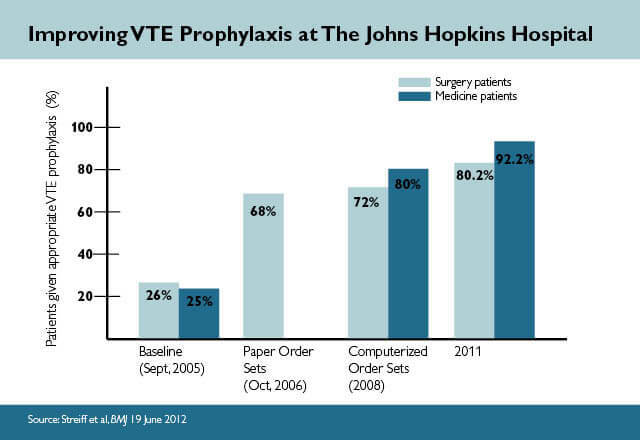 In a Johns Hopkins hospitalist service, monthly VTE prophylaxis compliance rates increased from 86 percent before introduction of web-based dashboards to 90 percent in their first month of use. The following month, the hospitalist service further incentivized VTE prophylaxis through an internal pay-for-performance program. After VTE measures were added to this dashboard, compliance reached 94 percent. This was published in a March 2015 Journal of Hospital Medicine article. Just 20 percent of patients who missed at least two ordered doses accounted for 80 percent of all missed doses. Nearly 60 percent of missed doses were due to the refusal of patients or family members. Nurses on low-performing units were more likely to agree that VTE prophylaxis is prescribed for patients who do not need it. These findings support a strategy that targets a relatively small group of patients and clinicians for interventions, rather than a blanket approach, such as educating all patients. Overall nurse education reduced the frequency of VTE prophylaxis non-administration. Nurses found the interactive Dynamic module to be more engaging, enjoyable and enable better patient engagement. These findings indicate that interactive, learner-centric education might be most appropriate to change practice and should be further applied to other domains of clinical education. Learn more at the Patient-Centered Outcomes Research Institute (PCORI) website. Nurse education modules: Find this course, called "Venous Thromboembolism Prevention: The Nurse's Perspective," on the Armstrong Institute's learning management system. Johns Hopkins users can take it for free via myLearning. The intervention dramatically reduced the proportion of non-administered doses (43%) and of patient refused doses (47%) of VTE prophylaxis on intervention floors compared to control floors. These reductions in missed doses were associated with a 40% reduction in VTE events. Our findings indicate that a targeted patient-centered education bundle improves health care quality by leveraging electronic data to target interventions in real time for at-risk patients.